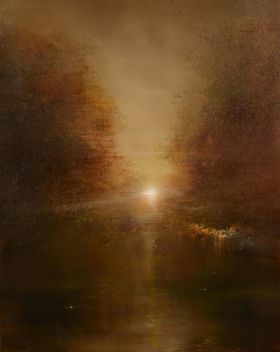 A Moment Remembered by Maurice Sapiro is a landscape painting capturing the rich tones of a fiery sunset. 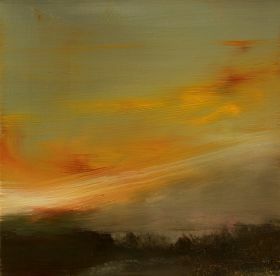 This painting depicts the fiery sunset with tones of orange, dark green, and burnt brown. A Streak of Gold is a breathtaking glimpse of the sun peeking over the horizon on a river between two silhouetted shores. 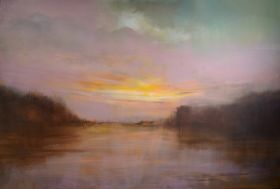 This painting features warm, natural tones of light against a cool, pastel sky. 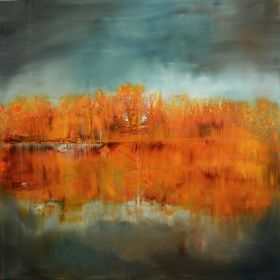 A Summer to Remember by Maurice Sapiro is a realist painting capturing the summertime landscape and water. 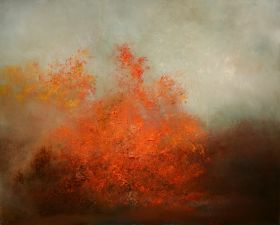 This painting is portrayed in fiery orange and burnt brown. A Touch of Blue shows a gold-green skyscape over silhouetted trees, with just a touch of deep blue sky peeking from within with clouds. 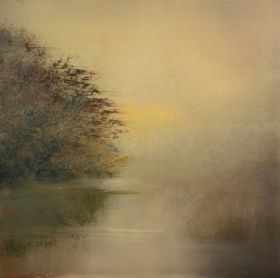 Across the River and Into the Trees by Maurice Sapiro depicts a leafy autumn shore on the far bank of a river, with a hazy view of the forest in the distance. This painting features warm, autumn oranges and yellow tones against a cool green river and sky. 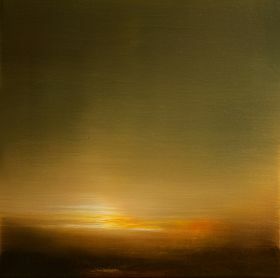 And the Angels Sing by Maurice Sapiro is a quiet depiction an evening just after sunset; among an otherwise clear sky, deep blue-green hues are met by the bright orange reflections on sparsely placed, low clouds. The earth below is a dark silhouette. 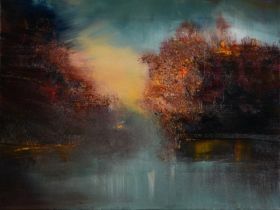 And the Dream Lingers On by Maurice Sapiro is a realistic and serene depiction of a scene as dusk approaches around the lake surrounded by foliage. This opulent piece features jewel tones of teal, rust and red. 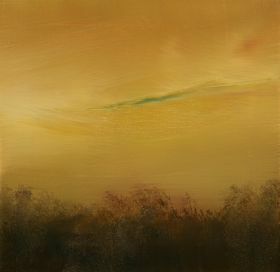 Angel by Maurice Sapiro is a warm watercolor painting that invites viewers to cherish the beauty in life. This piece will add an elegant flourish to any interior design. August Dawn is depicts a serene forest shoreline on a hazy morning. This painting contains soft touches of green, yellow and gray tones. capturing beautiful landscape of sky and water. This painting is portrayed in beautiful shades of earth tones. 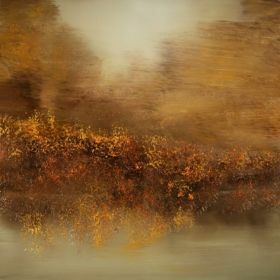 Autumn Fog is a misty, dreamy depiction of autumn colored trees against a soft, wet sky. This painting contains bright oranges and yellows against grayish greens. 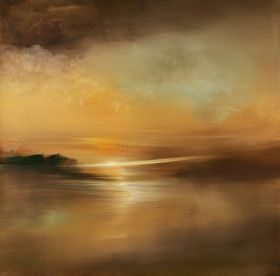 Bay Light by Maurice Sapiro depicts the beautiful romantic landscape and water at sunset. 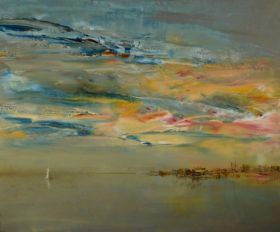 This textural piece features a varied palette of soft pink, mauve, and earth tones with accents of yellow as the last light of the sun fades into the horizon. 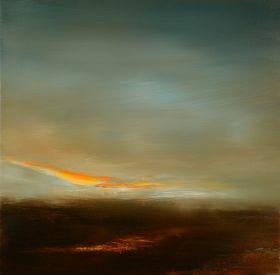 Before the Storm by Maurice Sapiro captures the fleeting jewel-like tones in the sky that occurs just before the storm. 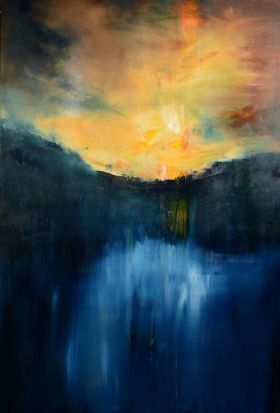 This fine art features a rich palette of blue and red tones with accents of yellow.